Homeboy comes home and does good! He’s one of our own and has become something of a regional celebrity. His words tickle our ears and we are proud of the charisma that is winning him a wide following and putting us on the map. Good for trade! Good for tourism! Good for kudos – for it takes a village to raise a child and we can bask in the reflected sunshine. His influence is our influence! But what happens when he starts to go off script? He is telling us parts of our story that we have forgotten and don’t want to hear. He is facing us with obligations that we not only do not want to own but that we find repugnant. And in doing so he holds up a mirror into which we would rather not gaze. Bring out the tar! Gather the feathers! Grab a rail! We will pay him back for betraying us to ourselves and calling us to who we are meant to be! But what’s this lingering sour taste in our mouths? Luke 4:21-30 reveals the shadow of epiphany. Next Sunday’s text takes us to Jesus’ inaugural address in his hometown synagogue. He tells it straight and the people don’t much like it. Such a short and simple address – less than two minutes! Most of it was quoting that oft-repeated passage from Isaiah. Many had heard it so often they could quote it by heart. The clincher was the assertion that followed, “Today this scripture has been fulfilled in your hearing.” The selected text ends here – you need to read on to see how the Nazareth congregation responded and how Jesus’ sermon turns dialogical. But next Sunday, we are the congregation and it will be our turn to react. Think of the space Jesus speaks from – the Epiphany season has honed us. This is the Jesus who, as an infant, was acclaimed in mysterious universal fashion in the visit of the magi, who evoked divine pleasure as he joined thousands of others in the River Jordan’s cleansing rite, and who drew back the curtain on the messianic banquet at a certain wedding in Cana. The congregation will never hear this text the same again, for the words now live in a way that invades and infuses their awareness, and challenges their orientation and practice. Some will welcome this, and others, many others, will resist because the status quo is more predictable and comfortable. But once seen epiphany cannot be unseen. We practise or perish! On Saturday it was my privilege to officiate the marriage of two widowed friends of advanced years. It has been a whirlwind romance of deep mutual respect and much fun and laughter together, catching up friends and family alike. The ceremony and wedding feast celebrated years of life, wisdom and experience, forged on particular journeys, coming together as one. The wedding feast at Cana comes readily to mind, where Jesus’ sign of water transformed into wine points to the presence of union at a depth that speaks of the completion and realisation of the messianic banquet. This is the third sign of Epiphany, following those of the visit of the Magi and the divine delight expressed at Jesus’ baptism in the Jordan. Ponder these things to gain a grasp of the wonder begun at the celebration of incarnation, where God became as us in Christ that we may, in Christ, become as God. Baptism of Christ by John: Artist Dave Zelenka. This file is licensed under the Creative Commons Attribution-Share Alike 3.0 Unported license. Down under, we are in that part of the year “when nothing happens.” Christmas/New Year is done and decorations are being boxed and put away. While a few are returning languidly to their daily labours and many are still enjoying the long vacation, many wait with bated breath for the contentious date of our official National Day on January 26 to pass, when, hopefully with a sigh of relief, we can all get back to whatever passes for normal living. And we miss what promises to be the most exciting season on the Christian liturgical calendar – the season of Epiphany which runs from the 13th day of Christmas (January 6) to the eve of the first day in Lent, the 40 day period of preparation for Easter. Epiphany is about God’s glory bursting forth in radiance throughout the cosmos. As we live the annual cycle of the Christ narrative, we internally claim the boon of living as fully divine offspring as a result of the Incarnation, and in preparation for the arduous self- reflection required of the Lenten period. It is a crucial part of the annual prayer rhythm in radiating the Christ story in engagement with and service of the world in its long arc of transformation to completion. Another Epiphany marker is the first sign offered by Jesus as recorded in the Gospel of John, the wedding feast at Cana where Jesus transforms water into wine, signifying to all present that the long-anticipated consummation of all things has begun. Here are three pegs on which we (who live south of the Equator) can hang our summer reflections. How does the glory and brilliance of the Christ story fill us as it fills and completes the universe? How do we give expression to an awareness that the Christ who lives in us and transforms us into his likeness evokes Divine recognition and pleasure? How will this translate in supreme service to the world we live in? Plenty to ponder as we prepare for this year’s adventure. On this first day of 2019, meet today’s guest number! I learned today that it has some significance as the Eighth Day of Christmas. It is somewhat fitting as, in Christian numerological tradition, eight is associated with new beginnings. Eight people survived the Great Flood by riding the ark to safety; this became associated with baptism and the Risen Christ who makes all things new. For Jenny and me, we had a greater sense of the dawning New Year as we watched the rosy colours of the sun setting upon 2018 for the last time. The midnight countdown seemed like an anticlimax. Then I learned again that for all ancient peoples, not just the Hebrew people, the day always ended at sunset and the new day began with the hours of darkness. I am reminded of a growing communal hunger for a via antiqua that is more in touch with our humble, earthy beginnings and that ever underlies our layers of technology and civilisation. New beginnings are sometimes a reclaiming of ancient wisdom. Oh, and our house number is now 8! Happy New Year! Diarmuid O’Murchu invites me to pause and give attention to my feelings and responses to his orientation on what The Spirit of God may be inviting us to this Advent. I’m happy to do just that! I respond to his dot points in italics. Opting for holistic rather than reductionist analysis. I’ve always been a big picture man. Every detail has a wider context to which it both gives and receives. The detail is incomplete without the whole of which it is a part. Suspicion of reason when used to the exclusion of intuition, imagination, emotion, feeling and spontaneous insight. I have always been located in the intelligence centre that is focused on rationality, discovering later in life the value of instinct, intuition and emotion as emanating from intelligence centres in there own right and deserving holistic integration into our “reasoning” processes. Dualisms are human constructs that have outlived their usefulness. I no longer see matters as a contrast between black and white, or even shades of gray. Life is wonderfully and complicatedly technicolor. Belief in the evolutionary nature of life at every level with three basic and universal movements of growth, change, and development. My instinctive “amen” is underlined by my acute awareness of these movements within my own interior being and my life-time observation of systems within nature, human history and organisation. It counters the “deus ex machina” idea that once dominated my thinking, even if unconsciously. The Spirit is actively, intimately and progressively involved in all aspects of the cosmos. There are no absolutes in an evolutionary universe – all is unfolding, emerging, becoming. I want to put a caveat on this one. Perhaps I’m misunderstanding, but I feel there are absolutes (eg Love) of which our perceptions are unfolding, emerging, becoming. Dominance of patriarchy beginning to fragment in meaning and effectiveness. It is dying a slow death – it will not lie down. From where I sit, it will take another generation to become noticeably weaker. Parameters set by past 5000 years of civilisation have been shortsighted, reductionistic, and irresponsible in their constructs of reality. Surely part of evolutionary processes. There have always been countermovements within civilisations, alternatively prized, tolerated and suppressed. Granted, there is still a long way to go before minority wisdom can be seen as a valuable offset to majority slumber. Expansive awareness of vast ages of the universe needs to become the normative basis on which we engage with daily life. I wonder if this requires either further evolution of our collective human capacity or combined human will to appoint leaders whose vision can be lifted higher than the next election. Belief that human wisdom is older than our cultural normative standards. Role of information explosion in the reclamation of knowledge from those who have used it for patriarchal power. The rise of the people in lateral rather than linear thinking. I would like to and need to explore this notion further. Belief that spirituality predates formal religions by several thousand years. A given – Australian Aboriginal spirituality a case in point. Being a life-long learner reframing wisdom and insight as new circumstances demand. Dogma in science and religion are major distractions and confusing obstacles in an evolving universe. As a questioner who regards the Apostle Thomas as my patron saint, I tend to agree. I refuse to use the sobriquet Doubting Thomas, however. His open and skeptical stance led him to be a powerfully effective Believing Thomas, spreading the way of Christ all the way to India. Separating dogma and progressive enquiry is a central task in this quest. So there we have it – a few steps further towards a fresh encounter with the Christ incarnation that is preparing to be rebirthed in our midst. I am sitting in the many layered histories of Kings Park – acutely aware of millennia of cyclical indigenous story, colonial appropriation with a desire to preserve a 200 year old outlook, and contemporary efforts to conserve an enormous biodiversity of flora unique to this region. 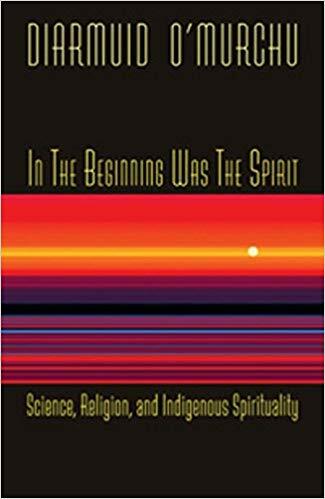 I have just read the opening chapters of Diarmuid O’Murchu’s “In the Beginning was the Spirit: Science, Religion and Indigenous Spirituality.” I have been drawn to O’Murchu’s writings before – perhaps I identify with his self-description as a “non-academic intellectual.” I suspect that for me this week he is my Advent messenger, my “John the son of Zechariah,” a post modern prophet challenging me to see again how the incarnation of Christ is born into a world of crumbling institutions (including formal religion) and lending my years to the vanguard of a renewed form of spiritual engagement. As Advent 3 approaches I look foward to contemplating his input further. Peace does not come peacefully. Advent is full of heralds who shout loudly to waken us and point us to a cacophony of events that are reshaping the order of human affairs. Fasten your seat-belts and don your crash helmets as we enter the readings for December 9! Today is the day of messengers. We are not sure we want to hear what they have to say – their words confront us where we would rather leave our heads in the sand. Their task is to awaken us and prepare us for cosmic changes. Change is always painful, but, in this season, the result is positive for all. This Psalm celebrates the anticipated outcome as if it has already occurred. In fact, so certain is the confidence of the worshipper that the promise is already fulfilled even in the waiting! From prison Paul rejoices and gives thanks for the community of Christ that is visible in the reign of love among those to whom he is writing. This is the ultimate outcome of all the utterances of the Advent messengers that have led to communities under Paul’s ministry embracing the Christ who has come into their midst. John the Baptist is the quintessential Advent messenger – the herald to which all the seers and sages of old pointed. His appearance is sudden, fierce and daunting. We awaken and take notice, however, for he comes preparing the way for momentous change – all for the good! Peace does not come peacefully!